“Drinks With” is an interview series started in 2009 by Skip and Timshel Matheny, currently songwriters in the band Roman Candle. The interviews are almost always done in person and typically discuss the creative process. Skip Matheny met up with Tig Notaro yesterday at her hotel in Nashville, TN. She is currently on tour promoting a Showtime special called Knock Knock, It’s Tig Notaro, which debuts tonight at 9 PM. It features her traveling across the country and doing stand-up in people’s homes. Paste: What’s your favorite drink? Tig Notaro : My favorite drink. I guess it would be sparkling water with lemon and lime. Paste: I was listening the other day to a journalist ask a famous actor “about their process” and they said, “What do you mean? My process started when I was born.” When you were younger, when did you start to notice funny people? Who was the first genuinely funny person you were aware of? Notaro: Well my mother. My mother was hilarious. Definitely. My whole family, especially on my mother’s side. My father is funny. But I would say my mother’s family. It’s all characters. People that don’t even know they are funny. People that are funny. My mother was truly funny. She was a huge influence of mine. Paste: Did you grow up in Mississippi? Notaro: I was born there and I lived there and we moved to Texas. So Texas and Mississippi. Paste: What was your journey like getting from there to Los Angeles? Notaro: My friends that I grew up with that I had moved around the country with, we ended up in Colorado, and they were going to go to LA because my friend wanted to produce sitcoms. And so I just went with them because they are going there. I had no interest in L.A. really. Paste: Once you were in L.A. how long did it take you to start out as a stand-up? Notaro: Well there’s the LA Weekly and it had every club, open mic, coffee shop, bar…I mean, there were laundromats—you could do stand up anywhere. And so when I saw all those opportunities, I’d always wanted to do standup… It’s funny because people think it’s so intimidating to start as a stand-up in L.A. because they are so many people there, but I felt like it was the opposite. I felt like it was more intimidating to do it in a smaller place with fewer opportunities. In L.A. I felt like I could fly under the radar as long as I wanted to in laundromats and coffee shops. It’s not like there is industry out there scoping out talent at the laundromat. I mean they could pop up there, but it’s not the main place to go. The first couple of weeks I was in Los Angeles, I looked at the LA Weekly and I told my friend I wanted to check out open mics and comedy clubs. So I spent the first two weeks in town checking out shows, and instead of intimidating me, I felt like “I think I can do this.” And I got started right away. Paste: How long had it been in your mind to be a comic? Notaro: I remember when I was in 7th grade my friend’s mother told my friend, “Tig could be a stand-up comedian.” And I remember that really struck me because I thought they were cool whenever I would see them on the Tonight Show or whatever. It was electrifying to hear that. You know that Billy Joel song “My Life?” There is a line in there about the friend that moved off to the west coast did a stand-up routine in LA. That was so electrifying to me, like “Whoa that’s the coolest person, off in LA doing stand-up.” So it was floating around in my mind, and I was always the funny mischievous one [growing up]. I think in high school was when I really started to buy records and watch stand-up specials. Probably early twenties is when I started thinking “I really want to try this.” I think I was 26 or 27 when I first tried it. Paste: From starting out at open mics up to the release of your first album, how long did it take you to figure out your voice as a comic? Was it almost fully formed from the beginning? Did you ever try “zany stuff” in your early days? Notaro: No. (laughs) No. I have heard feedback from people that have known me for a long time that say that I had my voice figured out pretty quickly. I feel that way but I also feel like I just got more comfortable and settled into things a little more. From the beginning to now I am always trying to allow myself to change when I naturally want to. I think no matter what you do once you have your voice figured out you can kind of do anything because your voice is there and people won’t think it’s weird, really. Because whether you do music or one-liners or stories or physical stuff, and they know what your voice is, you can kind of do anything. When I first started doing stand-up I didn’t smile. I was nervous, I would tell my jokes and then leave. And as time went on I was starting to get more confortable, and I allowed myself to smile onstage when I naturally wanted to. And I wanted to tell longer stories, and do more ridiculous things, or even when I said I had cancer, every step has been me allowing myself to take my own advice which is to just do whatever I feel. I think about if a friend of mine came up to me and said “You know, I am just a storyteller, but I really have this idea for a song that’s silly that I want to sing.” I would never go (tilts head) “You know you can’t and you shouldn’t do that because people don’t know you for that.” And it’s so soul-crushing to yourself. You should try it out. Maybe you’ll be like “this is the worst idea in the world and I never want to do it again,” but every time I have allowed myself to smile onstage, tell a long story, be honest, do something weird physically, it always moves my career forward. It always moves my writing, my thinking, everything forward. Paste: You have some of my favorite long pauses on comedy records. How long did it take you to get comfortable with those types of nuances in front of an audience? Paste: When you walked on stage at Largo in 2012 and announced you had bilateral breast cancer, so many parts of your life were already in the middle of a permanent transformation. How did that time in your life transform the way you wrote material? Notaro: When I walked onstage and said I had cancer, I really felt like I was plugged into a wall. I was so—I was so nervous, and I didn’t know how this was going to go. I didn’t know if I was going to offend people, all of that stuff, upset anyone, you don’t know what people might be going through in the audience, but I had to remind myself that this was my thing and so I had to just go on that. But It was a very weird time because the story blew up and I hadn’t really been performing for a while because I had been hospitalized for this other disease, I had been to my mother’s funeral, and to the hospital with her, and then I just popped on stage out of nowhere and said “I have cancer” because I had been out of the world for like 3 months or something, just dealing with C-Diff and my mothers death and my break up, and all this stuff, and when I had cancer and did that, it was right after that show that I went into dealing with having cancer, and then I went away again, and then my album came out and was number 1 around the world I think for 6 months. Then there was all this attention, and all of the sudden, I had no material. I was on every article and every show, and people were talking about me but it was very confusing. Even when I came out of that, the healing, the physical and emotional healing, and stuff, I still had to kind of get my bearings again. I could have said “Oh yeah I’ve been through so much and now I don’t care,” but it’s like all eyes were on me and so getting on stage after maybe 6 months was nerve wracking and I didn’t know what my point of view was. I didn’t know what I had to say. I felt truly like my squirmy early days. People thought I was so insightful and deep and dark and interesting, but I didn’t know —I…started all over again. It was horrible because I would get onstage and I had nothing to say and I was bombing. A part of me was like “Do I write for what people think I am now?” And then I had to really just think about what I think is funny. I had to stop worrying about what people were writing about me or thinking about me and if I want to write about silliness… It just all kind of goes back to just trying to be as real in each step, in each moment that I can be, and hope that whatever I write or whatever I perform is going to be enough for me and enough for them. Paste: Did figuring out what was funny again include getting out more and engaging with things that used to inspire you? Or the opposite? Notaro: It was such a confusing time because I didn’t know who I was anymore. I had changed. My life had changed. I still was trying to figure out how I felt, and what to do, and how to do it. I was scared to walk into comedy clubs because people were like: “We are so honored to have you here.” And I would say “Please, I am just here to watch my friend do a set.” [Then they would ask]”Do you want to go on? We would be so—you know—You can go on as long as you want…” and I was like “No I don’t want to do anything. I still have stitches in my chest. You know what I mean?” It was such a weird time. I think I was just trying so hard to grasp at who I was and what my point of view was, and how I was going to do it . And I think it was anything I saw, anything I saw in an aisle at the grocery store, or something about my health , I was just grasping for anything. I just really had to take a breath. The other problem was when I was about to do a set, the person introducing me would say (imitates MC voice) “OK Ladies and gentlemen, we are in for a treat tonight. Yes we have quite the surprise for you…” And I was standing back there going “No, I have no—I don’t know what I am saying.” They thought I was just going to walk out on stage and tell the dark truth of life, and of me, and you—and I didn’t—I was just trying to go through the motions for a while. I was really just trying to go into a comedy club, comfortably. I was trying to show my face to other comedians and wonder if people hated me. Because I wondered if people resented the attention I was getting, you know? I didn’t know. I am sure some people did but for the most part I was pleasantly surprised that people thought the album was great, or they thought I deserved it, or they were behind me. So there were several different hurdles to get through. As far as writing again, I finally had to let go of all of that pressure and just break through, like, what is making me laugh? What is funny? What made me laugh recently? Or ever? And to really think about that . Rather than what people want or expect. 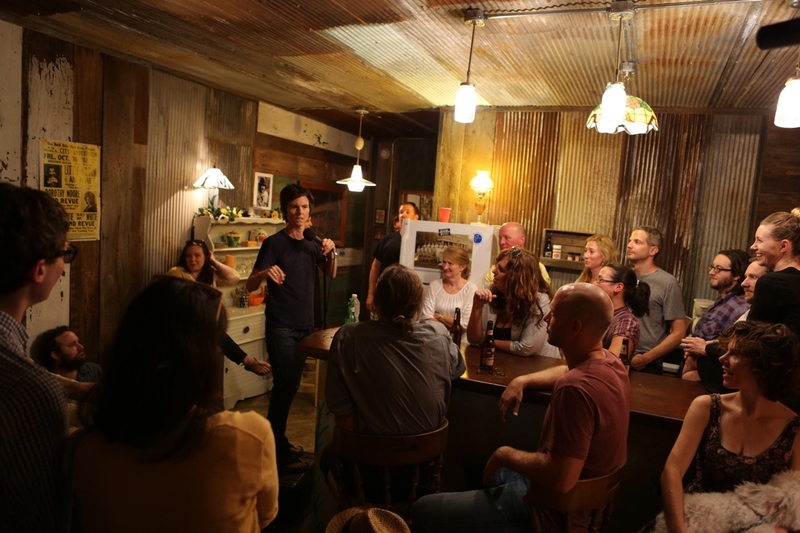 Paste: After going on this house tour which is documented in the Showtime special “Knock Knock: It’s Tig Notaro,” how much does the physical context you are in effect your set? If you lose the conventions of a comedy club or a theater, and all the lights are on in someone’s living room, are you still operating from roughly the same place?